After 3 years of producing first generation of motion simulators and one hundred sold pieces we released a new generation of 4DOF motion simulators. This version is more compact, easy to transport, the motion is faster and the feeling inside a cockpit is better and more realistic. 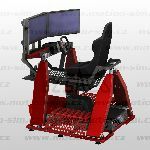 Extended car model with 4 moving legs, 3 x 27" Full HD LED displays with panoramic view, 5.1 sound system, professional racing seat with safety belts, professional racing steering wheel, 3 racing pedals (accelerate, brake and clutch) with a real braking characteristic, manual sequentional gear shifter or H-pattern gear shifter, handbrake, wind blower. Extended truck model with 4 moving legs, 3 x 27" FullHD LED displays with panoramic view, 5.1 sound system, real truck seat with air suspensin, cooling and heating system, real big adjustable truck steering wheel, 3 truck pedals (accelerate, brake and clutch) with a real braking characteristic, real truck H-pattern gear shifter. Extended flight model with 4 moving legs, 3 x 27" Full HD LED displays with panoramic wiew, 5.1 sound system, seat with safety belts, aviation yoke and pedals, wind blower. Recomended for real flight simulation. 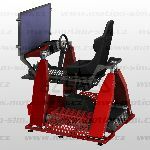 Extended car model with 4 moving legs, one 47" 2D/3D LED display, 5.1 sound system, professional racing seat with safety belts, professional racing steering wheel, 3 racing pedals (accelerate, brake and clutch) with a real braking characteristic, manual sequentional gear shifter or H-pattern gear shifter, handbrake.